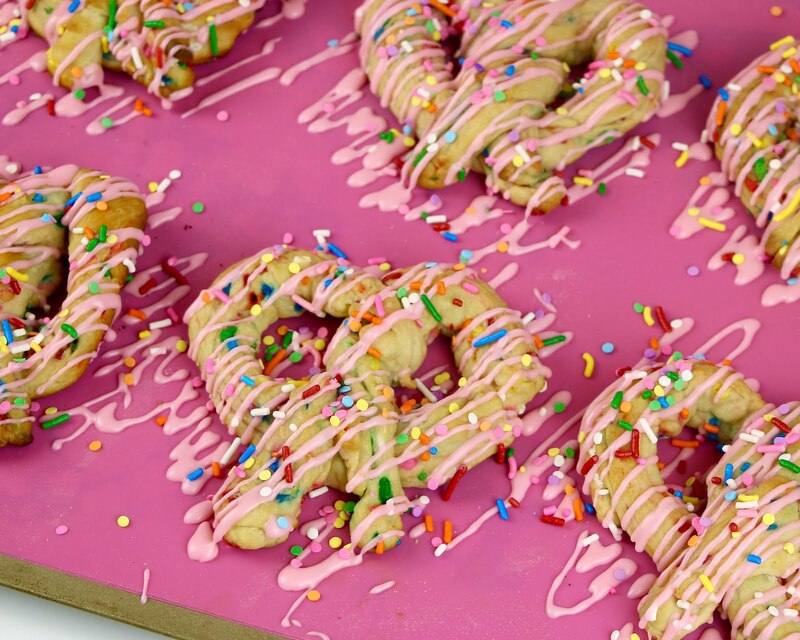 The most fun pretzel flavor in the entire universe. 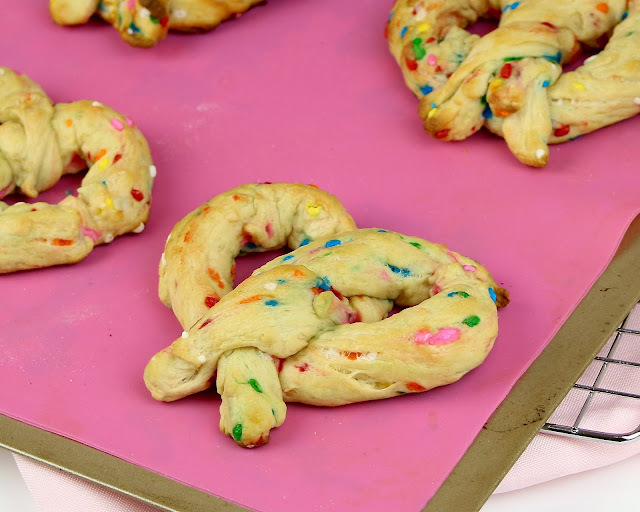 These funfetti pretzels have that chewy, crisp outside and warm, soft, fluffy inside. 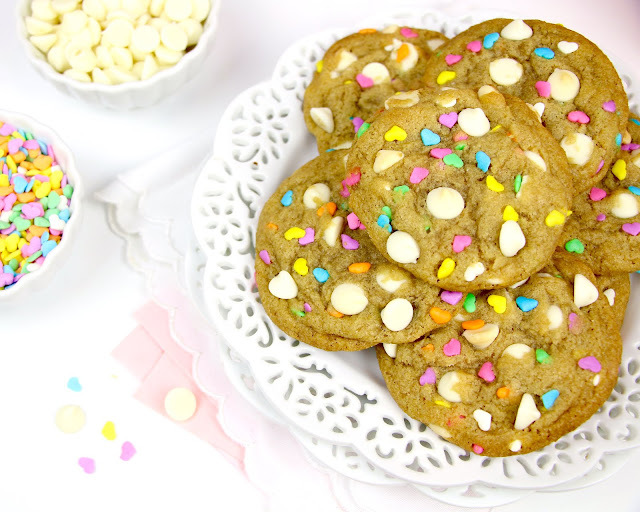 They're loaded with rainbow sprinkles, smothered in butter, and topped with a sweet glaze and festive sprinkles. 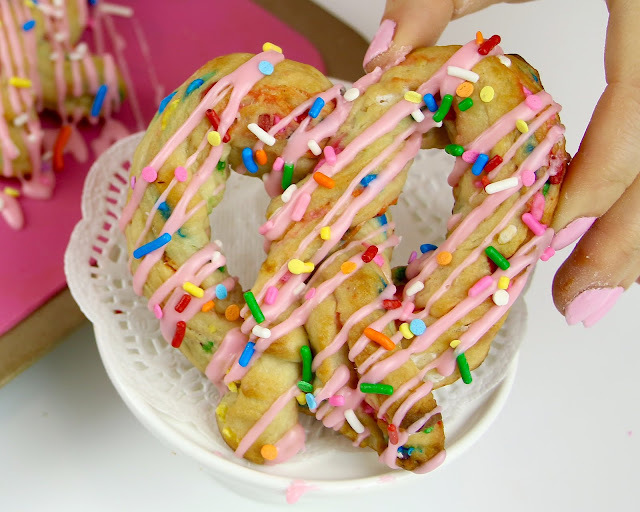 If you ever go to the mall and walk by the pretzel store, and smell that sweet, butter aroma they have wafting out of their shop, that is how amazing your kitchen will smell after making these. 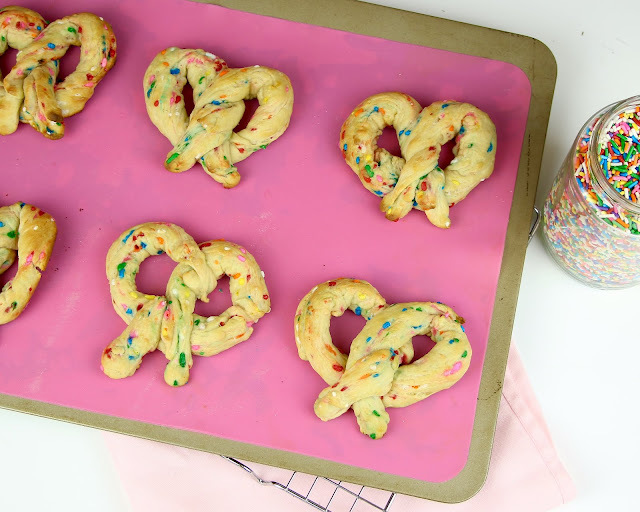 These pretzels are like a copy cat recipe of the kind you get at the mall, but in the best flavor on earth, funfetti, and, you can make these in under an hour! To put my own personal sweet spin on these pretzels, I use brown sugar, butter, vanilla and of course sprinkles, all throughout the rainbow speckled dough. And I like to use milk, instead of water, like most pretzel dough recipes, to make them extra soft, tender, and cake-ier. 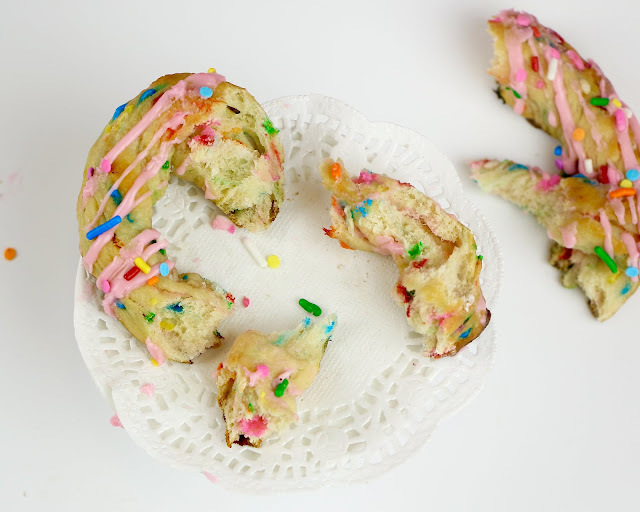 The best part is the coating of melted butter and sweet glaze on top that totally take these to the next level. 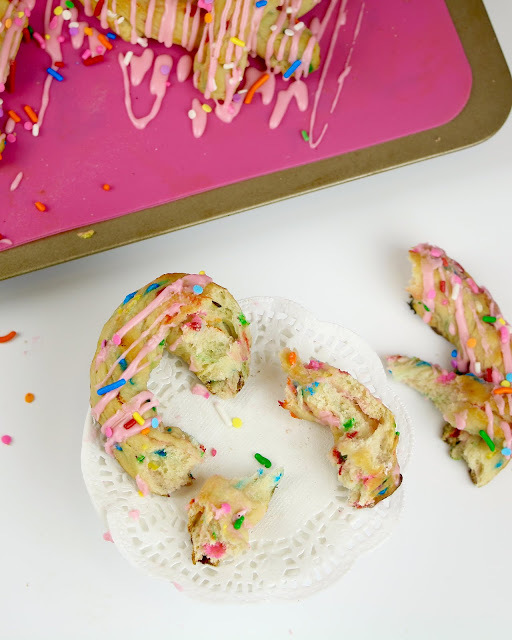 Why funfetti with sweet glaze doesn't exist in those pretzel shops at the mall? I have no idea! The dough is actually really easy to make, so you don't have to be scared of baking with yeast, because these come out perfect every time, and you don't even need an electric mixer to make these! 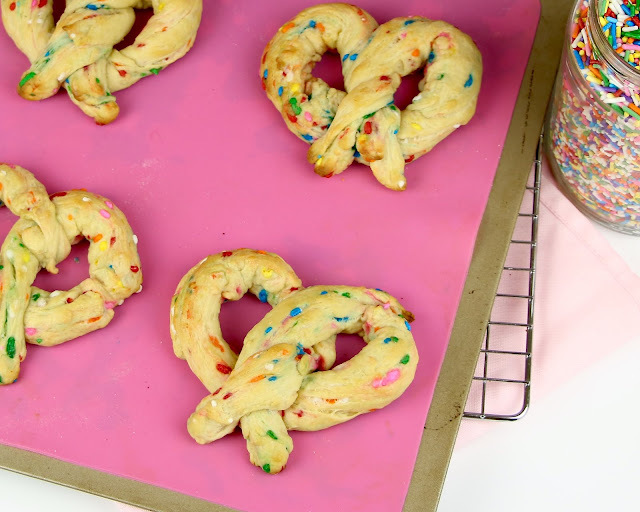 The one step that sets this recipe apart from any other dough, and makes it a real pretzel recipe, is taking the pretzels for a dip in a baking soda bath, right before we bake them. 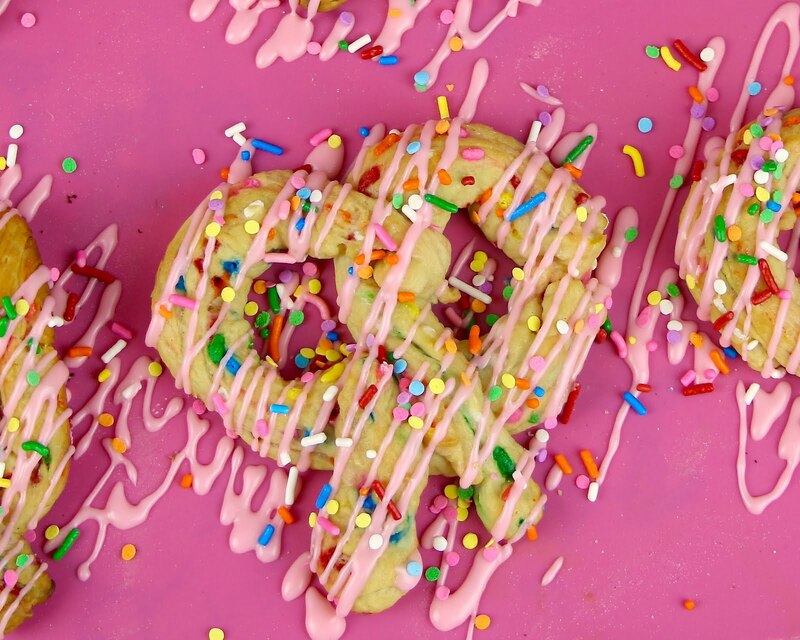 It sounds a little weird, but it's what gives the pretzels that iconic flavor and golden brown color. 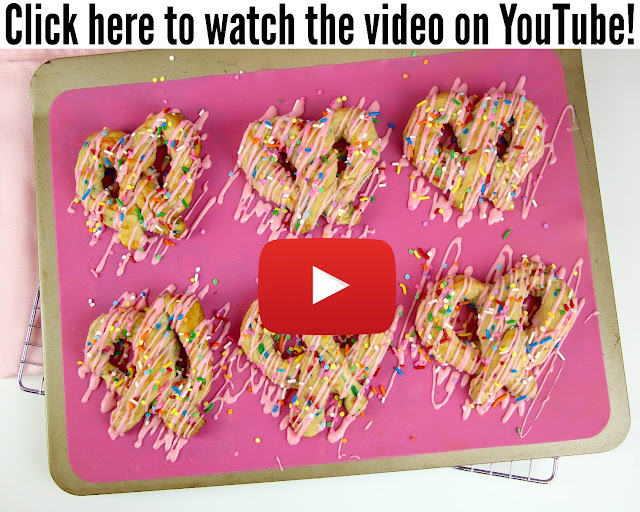 If you skip this step this recipe will still totally come out perfect, it just gives them that perfect pretzel flavor. 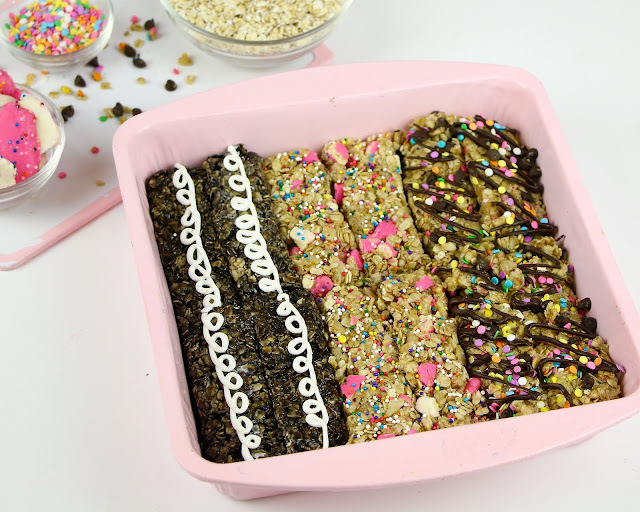 ...or my No-Bake Dessert Granola Bars, so be sure to check those out too! Meanwhile, preheat oven to 450°F. Line baking sheet with parchment paper and set aside. Bring the 4 cups of water and the baking soda to a rolling boil in a large saucepan. After 20-30 minutes, punch the air out of the dough and turn out onto a slightly oiled work surface. 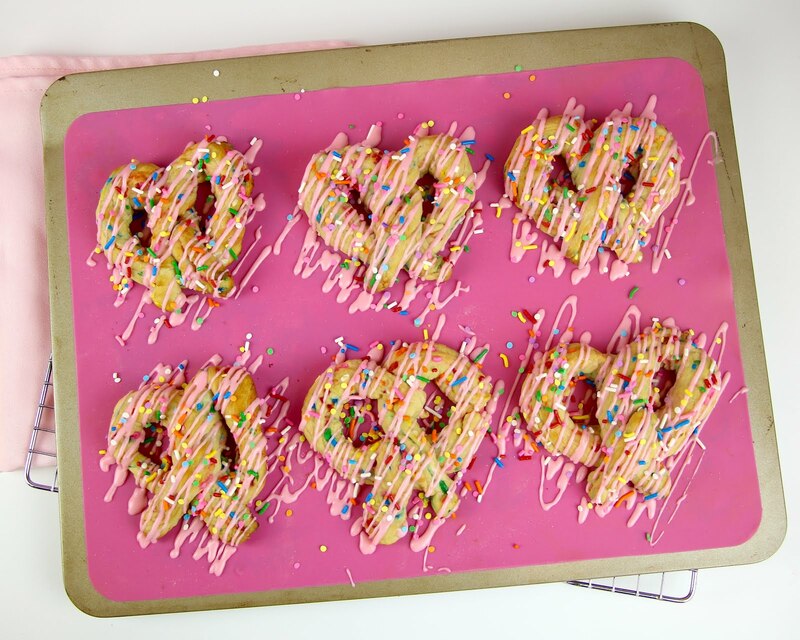 Divide into 12 equal pieces, using a pizza cutter or sharp knife. 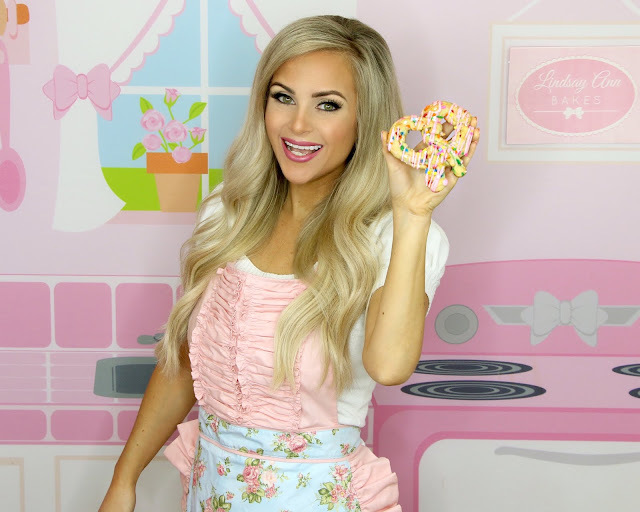 Stretch the dough into a long rope by pulling on each side and swinging it around like a jump rope, slapping center onto the countertop on the way down. Shape pretzels by making a U-shape with the rope, holding the ends of the rope, cross them over each other and press onto the bottom of the U. 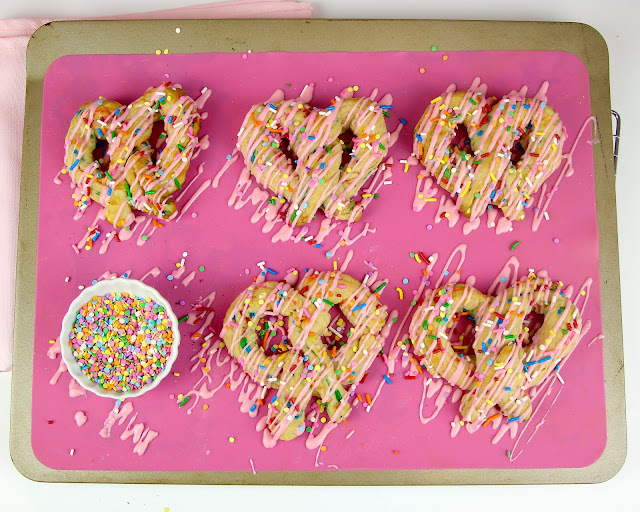 Using a slotted spatula, drop each pretzel into the boiling water for 20-30 seconds, lift the pretzel out of the water, allowing excess water to drip off and place pretzel onto prepared baking sheet. 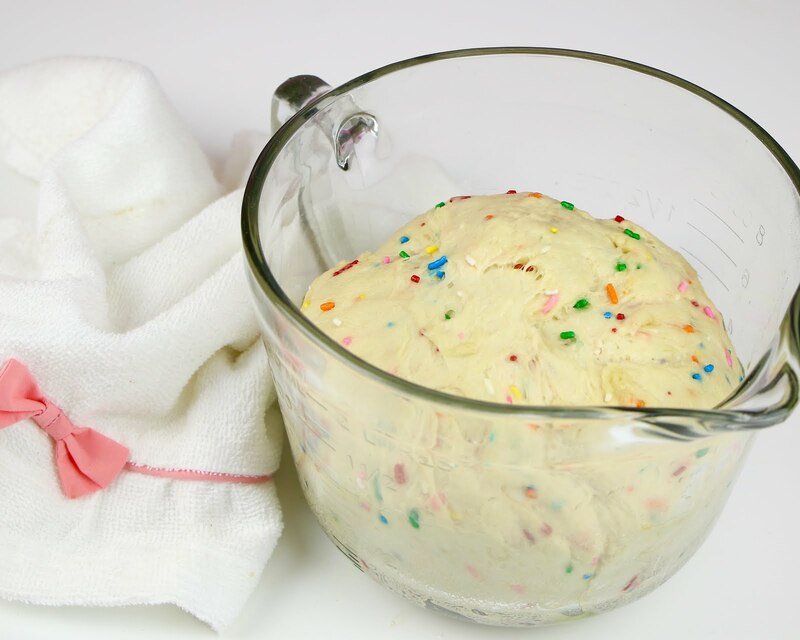 Do not let dough soak any longer, to avoid a metallic taste. Repeat with remaining dough. 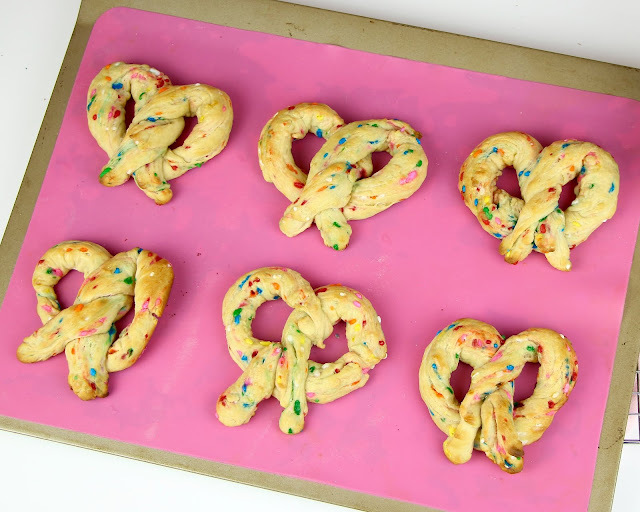 Brush pretzels with half of the 4 tablespoons of melted butter. Bake for 12-15 minutes or until golden brown. Meanwhile, for the glaze, combine all ingredients in a bowl and whisk until smooth, adding enough milk to reach your desired consistency. 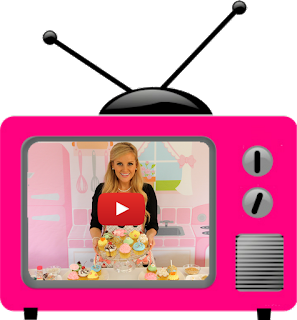 Transfer to a plastic sandwich bag and snip a tiny piece off of the corner, to make it easy to drizzle on top, if desired. 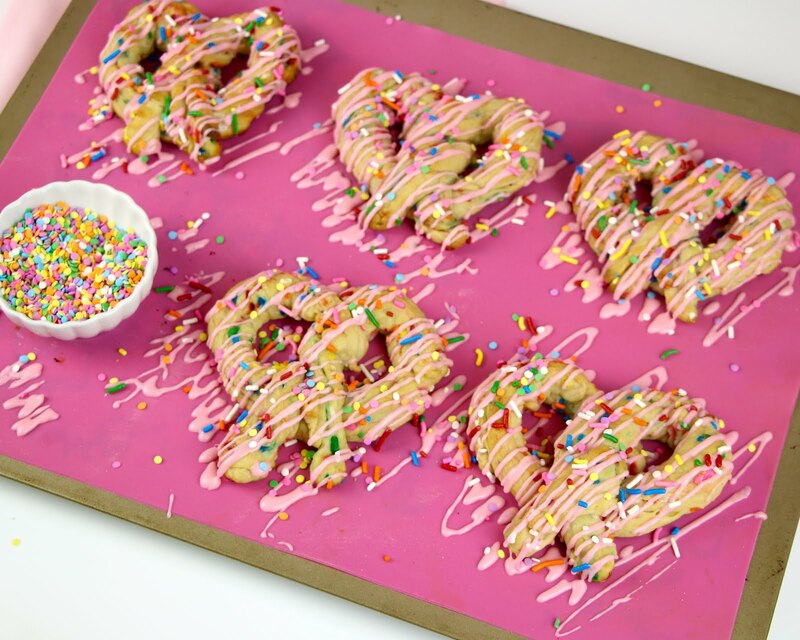 Remove pretzels from the oven and immediately brush with remaining melted butter. 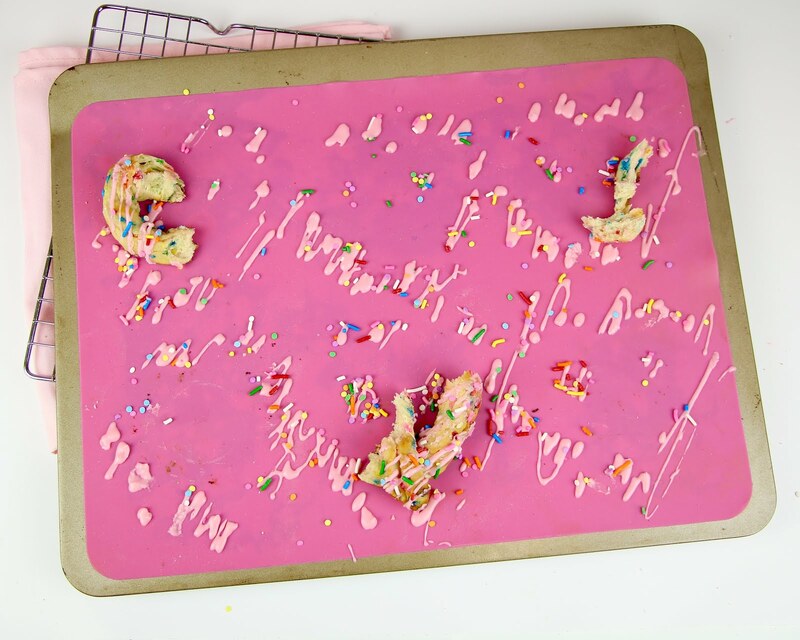 Drizzle glaze on tops and finish with sprinkles.